We eat a lot of rice. We eat rice every day. So naturally one of the first practical life things to expose my children to is how to measure, scoop and wash rice. So simple yet tons of fun, and they get such a sensory kick out of it. After plenty of trial and error, we know how much rice each family member eats. 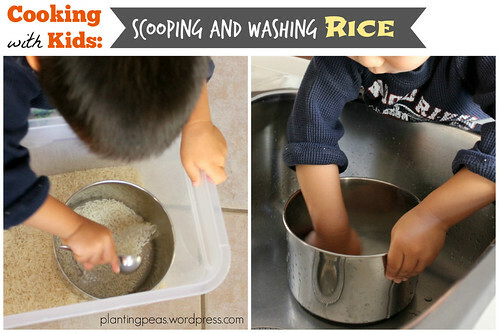 I leave a measuring cup and a 1 tbsp scoop in our rice bin permanently for quick measuring. We just bought a simple tote with locking lid to store our rice, it’s neater and easier this way, and avoids any unintentional spills. If you only eat rice occasionally, I suggest storing your rice in a small container will accomplish the same thing. My kids love running their hands through this bin full of rice. Such an awesome sensorial experience. Combine the rice with water, and boy the kids are ecstatic! I try to just let them wash the rice for as long as they want. We usually rinse the rice twice, pouring out as much water as possible in between rinses. Sometimes a blob of rice will fall together with the water, and the kids get such a kick out of it. We put our hands under the stream of dirty water to catch any rice that fall. 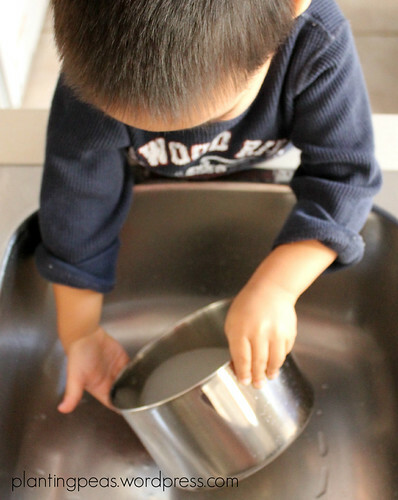 For more resources on kid-friendly activities, check out the places where I link up with!